...that Ahamkara grow larger and more powerful from granting wishes? ...that Saladin wished for an Ahamkara to become a dragon for bragging rights once he slayed it? "Oh the headache again. I swear it's these symbols..."This article does not meet Destinypedia's standards. You can help by cleaning this article. "Follow Skolas into Vex territory to aid in his capture for the Queen." Destinypedia has a walkthrough guide to this level, Queen's Ransom. See Queen's Ransom/Walkthrough. Queen's Ransom is a story mission in House of Wolves that takes place in Ishtar Sink, Venus. PETRA:Guardian, new orders from the Queen. She wants Skolas captured alive. I live to serve, of course. Just makes things a little harder, that's all. You'll be the tip of the spear. Get down there, find him and pin him. I'll be nearby with a capture team of Prince Uldren's Crows. PETRA: The team and I just set down in a canyon a few kilometers from the Citadel. When you find him, we'll be ready. The fireteam sets off along the path towards the Citadel. PETRA: So, he tried to conquer the other Fallen Houses and failed. Maybe now it's about the weapons? Outfitting the Wolves with Vex instruments of war? VARIKS: If Skolas thinks he is Kell of prophecy, then weapons could turn the tale. The fireteam reaches the Citadel. PETRA: Whatever he's up to, I've got a bearing on that signal. Top of the tower. Better start climbing, Guardian. The fireteam fights through some hallways and up a flight of stairs. They enter a large room open to the sky, with a tall lift protected by a shield. Vex and Fallen are fighting intensely. PETRA: Hmm. Strong gravity distortion at your location. The fireteam dispatches all enemy forces and overrides the lift's shields. They enter the lift. VARIKS: I was House Judgment scribe. I stood with Skolas for much of Reef Wars. Now, I stand with you in Judgment of Wolf Kell. That feels...right somehow. The lift deposits the fireteam at the top of the Citadel. There is a massive chasm between them and the next area. Small platforms flicker in and out of view across the void. A Ketch can be seen in the distance. PETRA: Skolas's Ketch! This is it, Guardian. The fireteam begins to cross the chasm using the warping platforms. PETRA: The Vex tech here matches a signature from the Vault of Glass. These machines fade in and out of our timeline. Watch your step. The fireteam continues the unstable platform hopping. PETRA: You're getting close. The Crows and I are inbound. The fireteam reaches the final area. Suddenly, numerous transfer gates open, and hordes of Fallen teleport in as if they were Vex. PETRA: What? Guardian, there are dozens of new Wolf signatures, and the number keeps growing. It's the Vex tech! PETRA: Skolas! He's pulling the entire House of Wolves through time! The fireteam fights their way to a clearing with a large gate guarded by two High Servitors. Skolas, Kell of Kells appears through it and roars something in Fallen speech. VARIKS: He just said, "I stole the gift of Freedom. Secrets of time and space. House of Wolves will stand forever." PETRA: He has no where left to run! Take him down! The Guardian defeats Skolas, who collapses to the ground, alive but weak. A Vestian ship arrives and surrounds him in a containment field. PETRA: The House of Wolves is broken! Stand by for a transmission. QUEEN: This is Mara Sov, Queen of the Awoken. 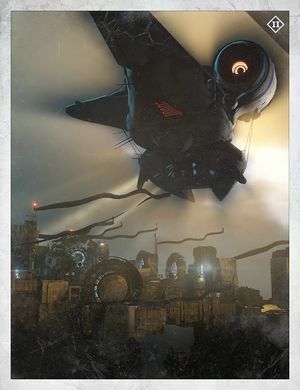 Guardian, when you first came in search of the Black Garden, I thought of you as just another Mote of Light, too far from its Traveler. I see now that I was wrong. Accept my thanks, and the promise of a fitting reward. Petra, bring Skolas to me! PETRA: Capture confirmed. I almost feel sorry for Skolas here. Conversations with the Queen can be...harsh. Anyway, I'll meet you back at the Reef with your reward. For a complete list, check out our Story mission directory.